Please keep in mind, we are NOT turning server time forward to Daylight Saving Time to Daylight Saving Time tomorrow. Server time will remain the same. You can always check server time here: https://na.archerage.to/page/profile/. This weekend Tournament was really fun. All rewards have just been sent. Hope to see you all next weekend. In case of any changes in rules we'll keep you informed. Don't forget to send your Entries for the next Sunday Tournament (March, 18) in Contact Moderators section or our Discord. We have a little change in the rules and leagues for the next Sunday Tournament (March, 18th). The only change in rules - stealth is now allowed. 1st league (High equipment league) - 5000+GS. 2nd league (Low equipment league) - less than 5000 GS. 1v1 Tournament will take place on Arena (Located in Two Crowns) as usual. Place for 5v5 battle is still under consideration. The chosen place will be announced shortly. Edit: Both 1v1 and 5v5 battles moved to Red Dragon's Keep (Karkasse Ridgelan). This was posted last night. Please moving forward get your entries in earlier rather then later. This is a great event with lots of prizes. We take your suggestions each week and make changes so I really do not know why we had such a low sign-up this week! We are stoping the event for a while due to 3.0 release. We will get back to it in some time. Gladiator Death Match Tournament returns! Make sure to send your entry. First Tournament date - Sunday, 9/2. Start - 1 PM. Location: Exeloch. You can find all the details in the main post of the thread. Don't forget to send your entry for the next Tournament - Sunday, 9/9! Get your team together and send a team entry to participate in 5v5 battle this Sunday. Winners of the previous week obtained a title Delta Troop. Become this week's winner and obtain a title Alpha Troop title. 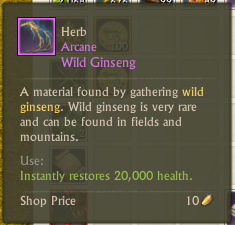 Wild Ginseng is so stupid is this thing, its a rare spawn item that restores 20k HP and has a 10 minute cooldown. Its completely unfair as someone that has to fight against someone with a Wild Ginseng (Essentially 2 HP bars), where the person that fights him next doesn't have to kill 2 hps bars as the opponents Wild Ginseng is on cooldown for 10 mins, and its completely based on how long it takes for the other person to get ready to fight. At this point I'm just not gonna ready up for 10 mins in-betweens fights so that I can win. I don't care if I win or not, but it would nice to not have to worry if someones ginseng is on cooldown or not in order to win lol. Ofc the person that fights him next is gonna have an easier time cause its on cooldown for "10 minutes"
Epic very good point but as of now they are considered to be a heal pot and everyone has access to them in game. Some people like them and others like yourself have issues with them. We also will never wait 10 mins between fights. I am going to suggest you make a poll on this and lets see where the community stands on this as a whole and then we can go from there. Update to Rule#4	4. Costumes are forbidden to be used in low equipment leagues. This has been changed to allowing all costumes/undergarments for all players. Please take note of this. Will do! I hope you can see how frusterating it can be though, having to kill a guy with essencially 2 HP bars on top of normal HP pots and then the guy fighting next would only have to kill the person through normal health pots. Making your loss unfair compared to the guy fighting after you, due to cooldown of the ginseng. Wild Ginseng classifies itself as a rare "material", not a potion. Where Nui's Novas and Alluvion Love classify as Rank 6 and Rank 7 "Heal Potion"
This Sunday, 9/16 team winner will receive a title "Bravo Troop". We are waiting for teams and solo players entries. We are waiting for all 1st and 2nd place 1v1 battles winners of September (and winners from spring tournaments) to participate in our Gladiator of the month battle this Sunday, 9/23rd. Winner will receive 3000 credits + costume, as it was mentioned before. - Honor point for battles +1. Teams that are willing to participate this week can send their entries as well. They will fight for the credit reward and title "Bravo Troop". Team that will win this Sunday's (10/14) Tournament, will be rewarded with a title "Charlie Troop". Sign up and win credit reward and unique title! Folks come join us for some fun and titles and great prizes. Sign up now! Team that will win this Sunday's (10/21) Tournament, will be rewarded with a title "Echo Troop". Sign up and win credit reward and unique title! Last chance to sign up go do that now. Teams sign up for tomorrow's battle! This weekend teams will have a chance to receive a title "Foxtrot Troop". Looking for more team sign ups and single entries. Sign up now!